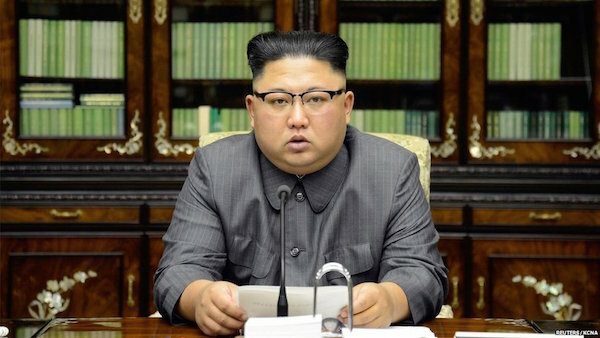 North Korean leader Kim Jong-Un Friday warned he would make US President Donald Trump “pay dearly” for threatening the destruction of his country at the United Nations. “Shaping the general idea of what he would say, I expected he would make stereotyped, prepared remarks a little different from what he used to utter in his office on the spur of the moment as he had to speak on the world’s biggest official diplomatic stage. “A frightened dog barks louder. “I’d like to advise Trump to exercise prudence in selecting words and to be considerate of whom he speaks to when making a speech in front of the world. The mentally deranged behaviour of the US president openly expressing on the UN arena the unethical will to ‘totally destroy’ a sovereign state, beyond the boundary of threats of regime change or overturn of social system, makes even those with normal thinking faculty think about discretion and composure. “His remarks remind me of such words as ‘political layman’ and ‘political heretic’ which were in vogue in reference to Trump during his presidential election campaign. “His remarks which described the US option through straightforward expression of his will have convinced me, rather than frightening or stopping me, that the path I chose is correct and that it is the one I have to follow to the last. “Now that Trump has denied the existence of and insulted me and my country in front of the eyes of the world and made the most ferocious declaration of a war in history that he would destroy the DPRK, we will consider with seriousness exercising of a corresponding, highest level of hard-line countermeasure in history. “Action is the best option in treating the dotard who, hard of hearing, is uttering only what he wants to say. “As a man representing the DPRK and on behalf of the dignity and honour of my state and people and on my own, I will make the man holding the prerogative of the supreme command in the US pay dearly for his speech calling for totally destroying the DPRK. The pot calling the kettle black!!!! I just want the People of N Korea, be set free and know there is a God contrary to what they are being fed. The man and his predecessors are all neurotic. A leanage of devil incarnates. They claim to be God and must be worshipped. Almighty Jah will soon afford him, a passageway to Hell. IJN, AMEN.